PART I. The Cambridge approach to social ontology 1. A conception of social ontology 2. Quine and the ontological turn in economics 3. The scope of ontological theorising PART II. Traditions and projects 4. The nature of heterodox economics 5. Economics as progress: The LSE approach to econometric modelling and critical realism as programmes for research 6. An evolutionary economics? On borrowing from evolutionary biology 7. Structure, agency and causality in post-revival Austrian economics: tensions and resolutions PART III. Interventions in the history of economic thought 8. Smith and Newton: Some methodological issues concerning general economic equilibrium theory 9. Metatheory as the key to understanding Schumpeter after Shionoya 10. Order without equilibrium: A critical realist interpretation of Hayek’s notion of spontaneous order PART IV. Methods 11. Methods of abstraction and isolation in modern economics 12. Applied economics, contrast explanation and asymmetric information PART V. Ethics 13. Critical ethical naturalism: an orientation to ethics 14. Realism, universalism and capabilities PART VI. Elaborating conceptions of social reality 15. 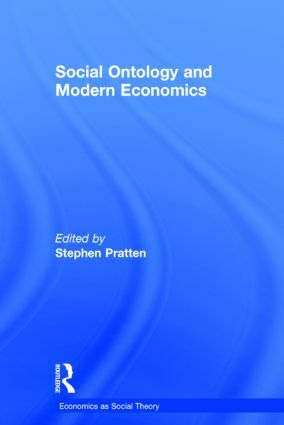 Ontology and the study of social reality: emergence, organisation, community, power, social relations, corporations, artefacts and money 16. Open and closed systems and the Cambridge school 17. The nature of gender 18. Technological objects, social positions, and the transformational model of social activity 19. Technology and the extension of human capabilities 20. What is an institution? Stephen Pratten is Senior Lecturer, Department of Management, King’s College London, UK.